There has to be a Hall for near greats -- right, Bettis? 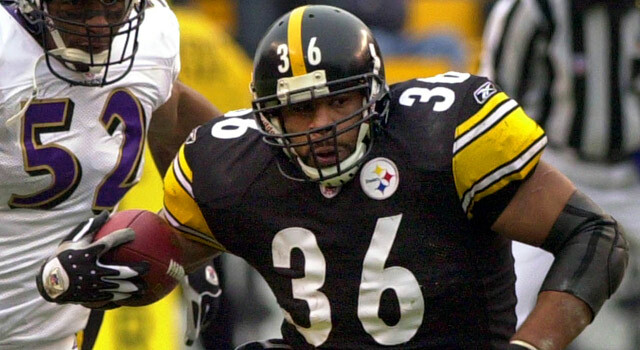 Published: Sept. 29, 2011 at 08:41 p.m.
Jerome Bettis was pretty good, but the best of the best? That is stretch. If I ever had the financial freedom to start my own philanthropic organization, I would love to put my time and energy into helping those hapless souls with a sad story to tell -- former NFL players who bellyache about never reaching the Pro Football Hall of Fame. Apparently, some players are unclear what the definition of "fame" means, and what the standard of being the greatest of the great is all about. So with that in mind, I would like to start my own Hall, called the Hall of Pretty Good. The HPG would serve those players who were pretty good during their NFL careers but just short of being called the greatest. Remember, Maverick and Goose weren't initially selected to Top Gun, because that was reserved for the best of the best. That didn't mean they weren't great pilots, but you have to draw the line somewhere, right? So I would like to start the Hall of Pretty Good in a town like Oklahoma City -- a good place, just not the best of the best. Like, who goes to Oklahoma City on purpose? So here goes. I'm happy to present the very first class of the Hall of Pretty Good. Carter turned around his career when he found religion, though I don't think Jesus would be so demonstrative after catching a 10-yard out (Jesus signaling a touchdown is something else). Carter has martyred himself after being snubbed for the Hall of Fame, but a quick comparison to Rice, Irvin and Sharpe shows that he was pretty good, just not great. Walker would benefit if it put the "Pro Football" in the Pro Football Hall of Fame and recognized his work in the USFL. But sadly, voters don't think that way. Otherwise, CFL great Damon Allen would be a first-ballot Hall of Famer. Walker had a nice career and helped make the Cowboys a Super Bowl championship team -- but only because they traded him. If you ever needed a coach who exemplified good but not spectacular, Cowher was your man. If you need further proof, consider that most AFC teams considered Three Rivers Stadium their home field in the AFC Championship Game. Johnson made a savvy move by going into television because being on television raises an HPG player into a Hall of Fame player -- just look at Howie Long. But looking over Johnson's career, he never led the league in receptions, yards or touchdowns. Just what was spectacular about it? Well, other than that catchy and mocked book title? Bettis is an interesting study because he did have a productive career and managed to stick around much longer than most bruising backs. But in the end, Bettis has to be compared to his peers like Emmitt Smith, Barry Sanders and Marshall Faulk, and there is no way he cracks the elite list. Great? No. Pretty good? You bet. Brown played for a long time and put up incredible cumulative numbers, but he never stood out among the pack. Brown never broke records or put his team on his back to carry them to the Super Bowl. Brown was never outspoken or flashy. Instead, he kept his mouth shut, showed up for work and was pretty good at what he did. And that is enough for the HPG. So, congratulations to the inaugural class of the Hall of Pretty Good. We're happy to have you here. But please, somebody tell Mike Vanderjagt to get out. He's not getting in here. Adam Rank knows something about being pretty good but not great. Talk about it via Twitter or via Facebook. Be sure to catch the latest on the Dave Dameshek Football Program. "Six trending topics from Week 4..."